This is Youngest Son (YS) with his bike in 2008. Husband is an avid biker (he has a couple of bikes...no Harleys allowed in this house, though!) and he really wants one of the boys to share his love of motorcycles. OS rode for a while, and will occasionally ride; MS has never expressed a desire to even learn; so husband bought this bike for YS in the hopes that he would learn to ride. Husband says YS is doing well with the learning, we just have to get down to the DMV for him to get his bike permit. As with any meme, if you join in and want to meet new people or share your picture with others, go visit Cara for Photo Roulette and link up! There are two young boys up the street who have these. Their dad loves to ride and is a great teacher. I'd love to photograph that awesome aqua bike! nice color. My husband loves motorcycles, but as a child, he called them Mo-keys. He still slips up and calls them that occasionally - it's cute, but don't tell him I said so. 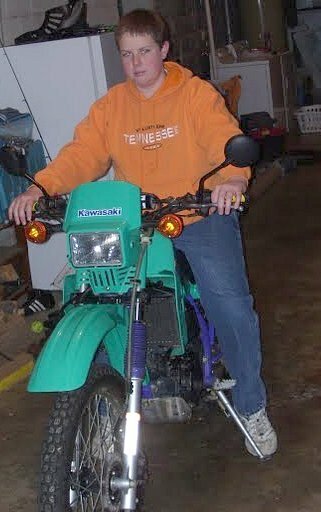 I love the aqua colored motorcycle...my first and only bicylce was that color. It is my favorite color of all. Sorry you had to go so far last night for a game....ouch! It would be nice for one of your sons to love motorcycling along with their dad. Love the motorcycle your son is on! I used to ride enduro/mudrun back in the day when my body would take it but gave it up in my late 20's. My husband loves Honda street bikes and has had three in our 25 years of marriage but always finds a reason to sell them and then always longs for another but doesn't want to put out the money. Go figure. Enjoyed your photo and story, Mary!